What started out as a BPM detection tool for DJs, runners and dancers, has become one of the finest iTunes™ library management tools around. beaTunes' powerful inspection feature let's you clean up your iTunes track data in a way unrivaled by any other software on the market today. Easily find typos or different spellings of artists' names, automatically fill in the album artist names, and much more. No more R.E.M. and REM in your iPod's artist list! 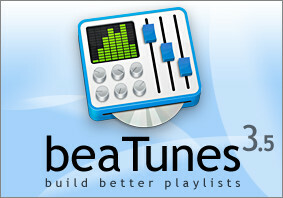 beaTunes can even help you to find the titles of tracks that have no artist or title associated with them. And once you have a clean collection, the built-in playlist generator works even better.